During our recent trip to Hokkaido, we enjoyed a host of new culinary experiences. The most spectacular one was without a doubt the sashimi dish that came with the fish’s still moving head in the middle. I’m not squeamish about food, but this did make me think twice before digging in. But then again, it’s an experience and how can I justify eating regular sashimi or even canned tuna, which also had a head at some point, if I don’t eat this? By the way, I try to avoid (canned) tuna altogether because tuna is becoming an endangered species. Click here to read a BBC article about it. In case you’re wondering, the head is purely ornamental. You’re not supposed to eat it. I tried looking for a scientific explanation of why the head was still moving despite the fish clearly being dead, what with its head being severed from its body and all. But I was unable to find it by just googling. I’m sure that it has something to do with electric signals being automatically generated in the brain or something, but that’s far from accurate. Anyone care to have a go at the science part of it? We ate this dish at Marukibune restaurant (next to the Ainu Museum) by the side of lake Kussharo. 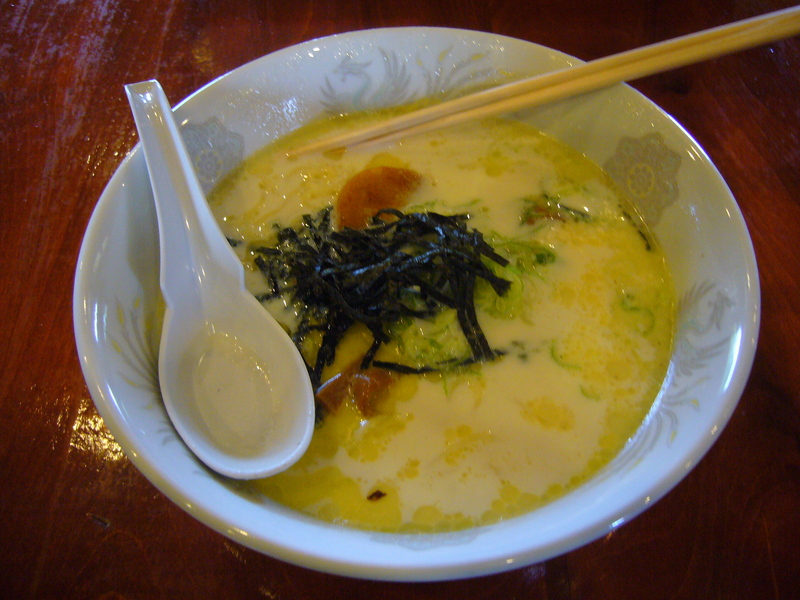 They serve all sorts of typical Hokkaido dishes like milk ramen and ‘jingisukan’ (see previous blog post for a picture of that dish). 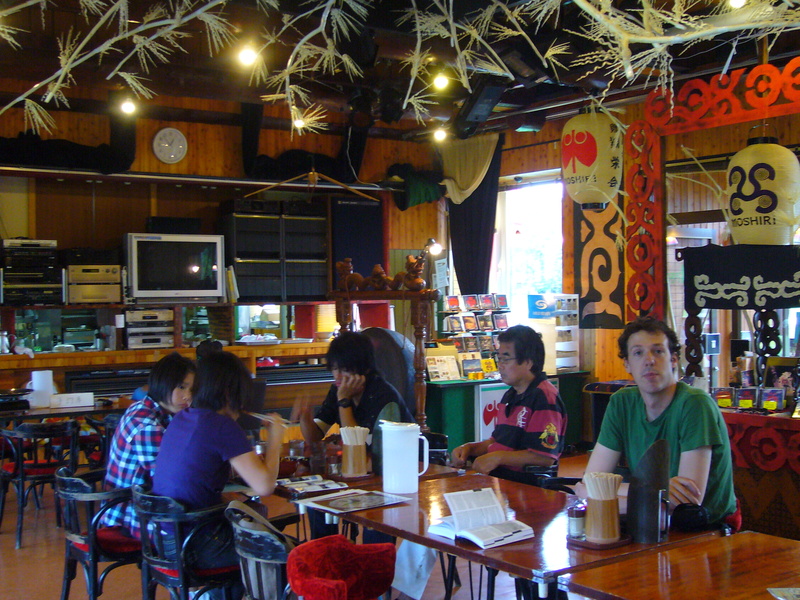 This post was submitted to the November 2011 Blogging Festval J-Festa: Dining in Japan. This entry was posted in Food, Japan, Restaurant reviews, Travel and tagged Fish and seafood, Food and drinks, Hokkaido, Ramen, Restaurant, Tourist information by Haruko-chan. Bookmark the permalink. This is very interesting, I think I would like to try this dish. I love fish… did you try to eat any of the fish head? I have had fried fish and eaten the head so I think I would try to give the head of a raw fish a try too. I don’t think you are supposed to eat the fish head in this dish. I think they put the head there for dramatic effect and perhaps to show how fresh the fish is. Yeah I know what you mean. I was kind of feeling guilty for eating the sashimi in front of the fish head. It felt as though the head was watching me. Quite a dramatic dish… but I think I prefer my meals decidedly dead. In all respects. I so want to visit Hokkaido! Hokkaido is great! I really recommend it, especially in the summer. As you know, I have to do food inspections on slaughtered pigs and cattle. I often see muscle contractions on the freshly slaughtered carcasses.The animal is death but the muscles are still alive and intact. They still contain a little glucose, with is the fuel that keeps the “engine” running idle for a little while. It sure is an indication that de fish is fresh and killed just before it arrives on your table. Witch is perhaps the reason why they put the head on the plate also. As prove of freshness for the cosumer. They must have aquaria in the kitchen to keep the fish alive till the moment of consumption. Ik wist wel dat ik op jou kon rekenen voor de commentaar papa! Indeed the fish was incredibly fresh. While we were eating, we were wondering where they kept the fish. After the meal we found the fish tank, just outside the restaurant next to the kitchen exit. As we approached the tank, all the fish panicked and started all swimming vigourously into one corner. Apparently they already know what it means when a human approaches the tank. We had to wait several minutes without moving before we could take this picture.